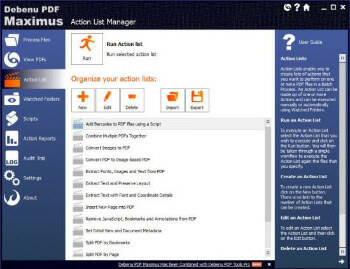 Debenu PDF Maximus offers unrivaled PDF productivity gains for businesses and individuals by allowing the creation of Action Lists to control the simplest or most complex PDF workflows in an easy and standardized way. Action Lists are made up of ‘Actions’ such as Image to PDF, PDF to Text or Digital Signatures, and can applied to single documents in Windows Explorer or Debenu PDF Reader. Capable of batch processing thousands of documents in Debenu PDF Maximus or even in automated workflows with Watched Folders. “Our goal with Debenu PDF Maximus has always been to remove the wasted time and costliness of inefficient workflows that involve PDF. With the release of version 2.0 our goal was to take things to the next level. With the productivity gains built in we’ve done this using new features such as Digital Signatures, Windows Exporer integration, a completely re-designed user interface and a new Server version, to name just a few improvements. ” said Debenu’s CEO, Karl De Abrew. Silent PDF printing enables you to completely automate workflows by having PDF files printed to a named printer. Automatically Build Bookmarks based on heading styles, text masks or a keyword list. Digital Signature support enables you to add visual signatures to PDF files on the page or as document level signatures. Sign an unlimited number of files without human interaction. Password Security enables you to add an Open password to a PDF or add a Master password with documents permissions such as no printing, no copying text and so on. Windows Explorer support means that you can just right-click on a PDF in Windows Explorer and use any of the Actions or Action Lists in Debenu PDF Maximus to process the selected files. Attach Files to your PDF files. These files are embedded inside the PDF and can be access via the attachments Panel in Adobe Reader when the PDF is opened. Set a Base URL in your PDF files so that you can use relative links inside the document. New user interface completely changes the look and feel of PDF Maximus and adds a massive again in ease of use and general user experience. Intuitive dialogs, built-in help files and touch screen optimized. Speedy PDF Viewer with continuous page viewing, bookmark navigation and text selection. Apply Actions and Actions Lists while viewing PDF files. General stability and performance enhancements across most areas of Debenu PDF Maximus, including text extraction, page extraction, rendering and more. Bookmarks support has been enhanced include the ability to add, edit and remove bookmarks from a PDF. Additionally, you can save a list of bookmarks to a text file. File Syncing Services can be given a dose of PDF processing power by creating Watched Folders in PDF Maximus and pointing them at folders in Dropbox, SkyDrive and other services. Watched Folders now includes a periodic background checker to ensure that Watched Folders don’t support working if an issue is encountered.